Joseph Thomas Logano (born May 24, 1990) nicknamed "Sliced Bread", is an American professional stock car racing driver. He currently competes full-time in the Monster Energy NASCAR Cup Series, driving the No. 22 Ford Mustang GT for Team Penske, and part-time in the NASCAR Xfinity Series, driving the No. 22 Ford Mustang GT for the same team. Logano is the reigning Monster Energy NASCAR Cup Series Champion. He previously drove the No. 20 Toyota Camry for Joe Gibbs Racing from 2008 to 2012, collecting 2 wins, 16 Top-5 finishes and 41 Top 10 finishes. Logano's first major NASCAR win came during the Meijer 300 at Kentucky Speedway in just his third start in the 2008 Nationwide Series. He became the youngest driver to win a Nationwide Series race at 18 years, 21 days old. The previous youngest was Casey Atwood in 1999 at 18 years, 313 days. Logano became the youngest winner in Cup Series history when he won the 2009 Lenox Industrial Tools 301 at New Hampshire Motor Speedway at 19 years, 35 days. The previous youngest was Kyle Busch in 2005 at 20 years, 125 days. Logano is now the youngest winner in two of NASCAR's three top divisions. Logano was also the first NASCAR driver born in the 1990s that has competed in NASCAR's three major divisions. In 2015, he became the second-youngest Daytona 500 winner behind Trevor Bayne. Logano was born in Middletown, Connecticut, the son of Deborah (Bidduk) and Thomas J. Logano. His father is of Italian ancestry. He began his racing career in 1996 as a 6-year-old quarter midget racer living in Connecticut. In 1997 Logano won his first Eastern Grand National Championship in the Jr. Stock Car Division. He followed it up with a Jr. Honda Division Championship in 1998 and in early 1999 a Lt. Mod. Division Championship. Later in 1999 Logano won 3 New England Regional Championships in the Sr. Stock, Lt. Mod., Lt. B. divisions. Logano's family then moved to Georgia. The transaction allowed Logano to win a Bandolero Bandits Series Championship. At age 10 he went on to racing Legend cars, where he set a 14-consecutive winning streak track record at the Atlanta Motor Speedway although would be broken in 2016 by Clay Thompson, along with a Lions National Championship. At age 12, Logano won the Southeast-based Pro Legends National championship. Afterwards he spent a couple years racing various forms of pavement Late Model racing. Veteran Nextel Cup Series driver Mark Martin, who was driving for Jack Roush (Roush Fenway Racing) at the time, called Logano "the real deal"; when Logano was 15, Martin said "I am high on Joey Logano because I am absolutely, 100-percent positive, without a doubt that he can be one of the greatest that ever raced in NASCAR. I'm positive. There's no doubt in mind." Logano was also nicknamed "sliced bread" (as in the greatest thing since) by two-time Busch Series champion Randy LaJoie. In 2005, he ran in 1 FASCAR Pro Truck Series race at the New Smyrna Speedway, started 1st and finished 2nd. He raced in the USAR Hooters Pro Cup Series, competing seven times in the Northern Division, and winning once at Mansfield, two Southern Division races, and five Championship Series races. The following season, he continued racing in the USAR Hooters Pro Cup Series. He raced in twelve Southern Division races, winning twice at South Georgia Motorsports Park and at USA International Speedway. He ran in one USAR Hooters Pro Cup Series, Northern Division race and six Championship Series races. In 2007, a new NASCAR rule allowed drivers 16 and up to race in the Grand National Division, allowing Logano to compete in the series. 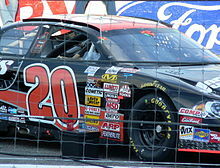 He finished the 2007 Grand National season with 13 starts in Camping World East Series, winning five races, three poles, 10 Top 5s, and 10 Top 10s, and winning the championship with wins at Greenville-Pickens Speedway, Iowa Speedway, two wins at New Hampshire International Speedway, and Adirondack International Speedway. He also has made 1 NASCAR West Series start at Phoenix International Raceway, where he started 2nd and won in the No. 10 Joe Gibbs Racing Toyota. On October 20, 2007, Logano won the Toyota All-Star Showdown at Irwindale Speedway, leading 87 laps and held off Peyton Sellers for the win. On May 4, 2008, Logano won the Carolina 500 during his ARCA RE/MAX Series debut with Venturini Motorsports in racing's return to Rockingham Speedway. Logano also made his NASCAR Craftsman Truck Series debut, at Talladega, in the Mountain Dew 250, starting 6th and finishing 26th. Logano attempted to defend his Toyota All-Star Showdown title he won in the 2007 season by driving in the January 2008 race, and was disqualified for crashing into Peyton Sellers in an unsportsmanlike manner on the final lap, in an attempt to win the race. Not only was Logano disqualified but he was credited as having run none of the laps of the race completing 0 laps. Logano made his NASCAR Nationwide Series debut at the Dover International Speedway in the 2008 Heluva Good! 200. Logano became the youngest winner in Nationwide history by winning his first major NASCAR series race at the 2008 Meijer 300 in only his third start, previous holder of the achievement was Casey Atwood On July 10, 2009, Logano won the Dollar General 300 by deciding not to pit unlike his teammate Kyle Busch who took four tires with twelve laps to go. By leading the pack, the clean air made it easy to beat Joe Gibbs Racing teammate Kyle Busch by five car lengths making it the first time he won at the racetrack in Chicago. He took his fifth series victory at the Kansas Speedway after a late race pass over teammate Kyle Busch. He earned his sixth Nationwide series victory at the Auto Club Speedway. In April 2009 Joey won the NASCAR Nationwide Series race in Nashville. On July 1, 2011, he won the Subway Jalapeño 250 at Daytona International Speedway, avoiding a last second crash. In mid-2011, Logano made a cameo appearance in the A&E series The Glades, in the episode "Moonlighting", as himself. In 2012, he won 9 times in the Nationwide Series. He won at Auto Club Speedway, after dominating the race in the Trans-Lux Camry. He won his second race of the year at Talladega Superspeedway after a push from Kyle Busch and holding off Ricky Stenhouse Jr. and Cole Whitt. His third win of the year came with controversy after on a late restart, he took out Points leader Elliott Sadler and went on to take the win. His fourth win came at Dover International Speedway, after passing Ryan Truex with 4 laps to go after being held back in lapped traffic. His 5th win came at Michigan International Speedway after holding off James Buescher on the final restart. In August at Bristol Logano took the lead from Kevin Harvick during pits and on the restart he held off Eliott Sadler to win his first win at Bristol in his career. He went on the complete the year sweep of the Nationwide races at Dover, and in October winning his 8th race of the year at Charlotte. In November he won the Nationwide race at Phoenix this would ultimately be the final race win Logano would score in a Joe Gibbs Racing car. The Joe Gibbs Racing No. 18 Nationwide car won the 2012 NASCAR Nationwide Owners Championship mostly due in part to Logano's success in the car during the 2012 season. In 2013 at Dover, Logano won both the NNS races for a third and fourth consecutive time in the Nationwide series. This made him the only driver to win 4 consecutive races at Dover in any series, and the all-time wins leader in the Nationwide Series at the track. In addition to his wins at Dover, he took home a Nationwide win at Chicagoland Speedway during a cup series off week in July. The Team Penske No. 22 car won the Nationwide Series owners title in 2013 a feat Logano has now contributed to three times in his career, once at Penske and twice at JGR. The 2013 Nationwide Series owners title was a first for Team Penske. In May 2014 at Dover, Logano saw his 4 race win streak come to an end when Kyle Busch won the spring race at the track. Logano looked to be in good position to win, starting from the pole for the 4th time at the track, but he was held up by Matt Kenseth for over 60 laps making Busch unreachable. He had to settle for a 3rd-place finish. In his next start in the Nationwide Series at Michigan, Logano was leading with 4 laps to go and was well on his way to his first win of the season, but suffered a blown tire and was relegated to a 16th-place finish. Logano started his 2015 Xfinity Series schedule at Atlanta by winning the pole and finishing 2nd. In his 2nd race of the season Logano finally returned to victory lane in the Xfinity Series at Phoenix International Raceway on March 14, 2015. He won from the pole and led 176 of 200 laps. He also scored his 2nd career perfect driver rating by dominating the race. On April 18, 2015 Logano led every lap of the Drive to Stop Diabetes 300 at Bristol after starting 2nd. As a result, he scored his 2nd Bristol win in the series and 3rd career perfect driver rating. On March 28, 2015, Logano driving for Brad Keselowski Racing started on Pole, led 150 of the 258 laps, and easily won his first Camping World Truck Series race in the Kroger 250 at Martinsville. He became the 26th different driver to win in all three major series, the first since his teammate and truck owner Brad Keselowski did it when he won the UNOH 200 Truck race at Bristol in August 2014. His first pole and win in the series came in his 7th career start. The 2016 Xfinity Series started well for Logano with a close second to Chase Elliot in the season opener at Daytona. In the coming races however the Penske 22 car lacked the speed it had done in previous years with Logano only able to take 9th at Bristol and 7th at Dover. In between these two races Logano had been in contention for a victory at Talladega up until a last lap crash relegating him to 27th position. Charlotte, Pocono and Michigan saw finishes of 3rd, 5th and 6th respectively. Logano would have to wait till Watkins Glen claim his first win of the season driving a secondary Penske entry the number 12 at Watkins Glen, the majority of the race was a hard fought contest between Logano and Keselowski who would eventually encounter issues and retire allowing Logano to collect his 26th career win. Chicagoland saw Logano struggle again with lack of speed driving the 22 to a 7th-place finish. Back in the number 12 Logano would take his 27th career win in the Drive for Cure 300 at Charlotte stealing the race win from a dominant Kyle Larson, this would be his second and final win of the year. His Xfinity Series campaign ended with a solid 4th at Kansas, unable to take the flagship 22 car to victory lane in 2016. On August 25, 2008, Joe Gibbs Racing called a press conference to announce that Logano would drive the No. 20 Home Depot Toyota Camry in the 2009 Sprint Cup Series. Logano replaced Tony Stewart who left JGR to drive for his own team, Stewart-Haas Racing. Logano was also a candidate for the 2008 Rookie of the Year award and was scheduled to make his first Sprint Cup start in the No. 02 Home Depot car at Richmond, but failed to qualify for the event. On August 28, 2008, Hall of Fame Racing announced that Logano would drive five races in their No. 96 car during the 2008 Sprint Cup Series. His official debut was at New Hampshire on September 14, 2008, by starting that race, he became the first NASCAR driver born in the 1990s to run a Cup Series event. On September 5, 2008, Logano made his first appearance in a Sprint Cup car at Richmond International Raceway in the two-hour-long Friday practice for the Chevy Rock & Roll 400. Due to Tropical Storm Hanna, qualifying was rained out. A NASCAR rule states that when qualifying is rained out, the top 43 drivers in owners points are then set for the race. Logano was not in the top 43 in owners points, so he did not get to debut. Logano is the youngest post-modern-era driver to compete full-time in NASCAR's top division (records show drivers as young as 15 competing in NASCAR's top division, but those records will stand due to age requirements). In 2009, Logano finished 4th in his first Gatorade Duel, and would become the youngest driver to start the Daytona 500, however, he would crash midway through the race and finish dead last. Logano's first three starts in the Sprint Cup Series saw three finishes of 30th place or worse. Las Vegas was his sixth start in the Sprint Cup Series, he finished 13th. In April, Logano finished ninth for his first top-ten finish at Talladega; later that month at Darlington, he led 19 laps late in the race and finished ninth. Logano won the fan vote for the 2009 NASCAR Sprint All-Star Race, and finished in 8th place. On June 28, 2009, Logano won the rain-shortened Lenox Industrial Tools 301 at Loudon, New Hampshire, beating Jeff Gordon and Tony Stewart, becoming the youngest winner ever in the Sprint Cup Series at the age of only nineteen years, one month and four days old. On November 22, 2009, Logano was crowned the official 2009 Sprint Cup Series Raybestos Rookie of the Year, having beat out other rookies Scott Speed and Max Papis. Logano won his first Coors Light Pole Award on March 19, 2010, for the Food City 500 at Bristol Motor Speedway. Despite going winless, he scored 7 top five and 16 top ten finishes en route to a then best 16th-place finish in the final points. Logano struggled through the 2011 season, with just four top 5 and six top 10 finishes, and two pole positions, en route to a 24th-place finish in the final points. Crew chief Greg Zipadelli left the No. 20 team at the end of the 2011 season to become the competition director at Stewart-Haas Racing. Jason Ratcliff was named Logano's new crew chief beginning with the 2012 season. In 2012, following several wins in the Nationwide Series, Logano won his second Sprint Cup Series race at the Pocono 400 at Pocono Raceway, after overtaking Mark Martin with four laps to go, and holding off Martin and Tony Stewart. Logano became the first driver in 30 races to win a race from the pole position. It was also the first time Logano had won a race that had gone the scheduled distance (as his 2009 victory had been in a rain-shortened event). He scored one other Top 5 and 11 other Top 10 finishes en route to a 17th-place finish in the final points standings. On September 4, 2012, it was announced that Logano would be leaving Joe Gibbs Racing and heading to Penske Racing in 2013, following an announcement that Matt Kenseth would drive the No. 20 Toyota. Logano moved to the No. 22 Shell / Pennzoil Ford for Penske, finishing 17th at Bristol after losing control after contact with Denny Hamlin. Late in the race, it would appear that Logano passed Hamlin on the track, but both had issues and Hamlin finished 23rd; Logano claimed that his former teammate intentionally wrecked him. The next week, at Auto Club Speedway, Logano had his breakout race, leading 41 laps. The final laps saw an intense dogfight between him and Hamlin; on the last lap proper, Logano and Hamlin were driving hard side-by-side down the straightaway, in what looked like what was going to be repeat of the photo finish from Darlington in 2003 but on the last corner, neither car lifted, both wrecked, while Kyle Busch slipped past and took the victory. Hamlin fractured his vertebra in the crash and after the race, Logano was confronted by Tony Stewart, who slipped back to 22nd after Logano blocked him on the final restart. Stewart pushed Logano, who responded by throwing a water bottle at him. Logano was scored in 3rd place. Just before the start of the NRA 500 at Texas Motor Speedway, both Penske Racing cars driven by Logano and Keselowski failed pre-race inspection due to an issue with the cars' rear-end housings. 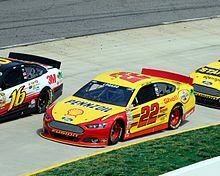 Logano was forced to start from the rear of the field because his car wasn't on the starting grid until after the command had been given, but he rallied for a 5th-place finish. Three days later, NASCAR unveiled large penalties for the infraction. Logano and Keselowski were each docked 25 points in the drivers' championship standings; Logano’s crew chief, Todd Gordon, was also fined $100,000 and suspended six weeks. Car chief Raymond Fox and team engineer Samuel Stanley were suspended for the same length of time as well. Identical penalties were also handed down to all of the people in the same positions on Keselowski's team. Penske Racing released a statement saying the organization planned to appeal the penalties, but on May 1, the NASCAR Appeals Panel unanimously upheld the penalties. Team owner Roger Penske said he would further appeal the ruling to NASCAR Chief Appellate Officer John Middlebrook. Meanwhile, on the track after Logano's 5th-place finish at Texas, he had a low weekend at Kansas when he collided with a spinning Kyle Busch on lap 105, destroying the front ends of both cars and ending their days. This would relegate him to a 39th-place finish. He was able to rebound the following week at Richmond with a third-place run. At Talladega, Logano finished 35th with an engine failure after 143 laps. At Darlington, he struggled with the handling of his car and finished 22nd, two laps down. Returning to Daytona for the Coke Zero 400, Logano was running well until he cut a tire and hit the outside wall on lap 71, leaving him with a 40th-place finish. He then had another 40th-place finish the following week at New Hampshire after being involved in a crash early in the race. After a two-race streak of bad luck, Logano picked up steam again, with six straight Top 10 finishes — 8th at Indianapolis, and then 7th at both Pocono and Watkins Glen. In qualifying at Michigan, Logano won his sixth career pole position with a track-record lap speed of 203.949 miles per hour (328.224 km/h); this was at the time the ninth fastest qualifying speed in NASCAR history, and the fastest since Bill Elliott's qualifying run at Talladega in 1987. He later went on to win the Pure Michigan 400, making it his first win with Penske Racing. Thanks to that win, and two more Top 5s at both Bristol and Atlanta (where he led 78 laps and almost won), he entered Richmond 8th in the standings with a shot to make the Chase for the first time in his career. At Richmond, he struggled with an ill-handling racecar to a 22nd-place finish, but it was good enough to where he beat Jeff Gordon (who finished 8th) by just one point for 10th in the points and made his first ever appearance in the Chase. Even if he had fallen to 11th, he still would have had the second wild card thanks to being ahead of Martin Truex, Jr. and Ryan Newman in points (Kasey Kahne had already locked up the first Wildcard with wins at Bristol and Pocono). Also thanks to the win, Logano seeded 6th in the Cup standings after it was reset. Logano started his first Chase run by qualifying on pole in GEICO 400 at Chicagoland with a new track qualifying speed record of 189.414 mph. However, he finished 37th in the race due to an engine failure late race. This was followed by a 14th-place finish at New Hampshire. Logano then had back-to-back top fives with a 3rd-place finish at Dover and fourth at Kansas. This was followed by three Top 20 finishes — 18th at Charlotte, 16th at Talladega, and 14th at Martinsville. He finished out the season with three straight Top 10 finishes — 3rd at Texas, 9th at Phoenix, and 8th at Homestead-Miami, leading him to a career-best 8th-place finish in the final points. Logano started with an 11th-place finish in the 2014 Daytona 500, followed by a fourth-place run at Phoenix. He won his first pole of the year at Las Vegas, taking another 4th-place finish. At Texas, Logano running with consistent speed got his first win of the season after leading the most laps (108) and performing a last-lap pass on Jeff Gordon during a green-white-checkered finish. This win locked him into the 2014 Chase. At Richmond (a track where he had seen little success in his short career), Logano led late and pulled a Ron Bouchard-style move during a shuffle between Jeff Gordon, Brad Keselowski, and Matt Kenseth in the last nine laps, to slip away with a victory. The victory marked 2014 as Logano's first season with multiple career victories. Logano made his 200th cup series start at Kentucky Speedway on June 28 at the age of 24. At Loudon, Logano was running second to Keselowski when he was involved in an accident with the lap-down car of Morgan Shepherd. Logano said in an interview that Shepherd should have not have been on the track running those very slow speeds, but NASCAR responded that Shepherd maintained minimum speed. Logano took his third win of the season at Bristol in the Irwin Tools Night Race. Keselowski finished second in the same race, making this Team Penske's second 1–2 finish in its history, the other coming in the 2008 Daytona 500. Logano would go on to win at New Hampshire, locking him into the Contender Round. He took four tires on lap 247, while the other front-runners ran on older tires, giving Logano the advantage. Remarkably, he was able to move from 16th to 2nd in 11 laps. He took the lead with 27 to go and won the race after a green-white-checkered finish. The win moved him to 2nd in points – one point behind Keselowski. This win marked Penske's 3rd win in a row and 4th in 5 races. On September 25, 2014, it was announced that Logano had signed a multi-year contract extension with Team Penske. This extension came a full season before his contract was due to expire at the end of the 2015 season. The contract extends Logano's tenure with Team Penske to at-least 2018. At Dover, Logano would finish 4th, making him the only driver to finish Top 5 in all three races of the contender round. He would finish the round second in points. Logano started the Contender Round by winning at Kansas. This gave him the lead in the point standings for the first time in his career. With the win, he was the first driver to advance to the Eliminator Round in the chase for the Sprint Cup. Logano followed this up with a fourth-place finish at Charlotte. This was his fifth straight top-five finish, making him the first driver to start the Chase with five straight top 5 finishes, beating the previous record of four set by Juan Pablo Montoya in 2009. At Talladega, Logano finished 11th after helping Keselowski get to the front on the final restart. Keselowski was in need of a win in order to advance to the next round of the Chase and was able to achieve that in part thanks to Logano. Logano entered the Eliminator Round as the points leader, beginning with a fifth-place finish at Martinsville. At Texas, he fought back from pit road tire issues that led to a spin-out and finished 12th. Going into the final race of the Eliminator round, Logano was tied for 1st in points with a 13-point advantage over the final transfer spot. He would finish 6th at Phoenix, easily advancing to the Championship round alongside Denny Hamlin, Ryan Newman, and Kevin Harvick. In the final round, he ended up finishing last of the final four drivers. The result was effected by some mistakes made by his pit crew, relegating him to a 16th-place finish. Logano and his teammate Keselowski were both dominant in the new knockout-style qualifying in 2014. Logano had 1 pole, 8 top-2 starts, and started in the top 10 in 26 of 36 races. He missed the final round of qualifying in only five of the 36 races, a series best. Logano was consistently near the top of most major statistical categories in 2014 including; laps led, average start, average finish, and average driver rating. He was one of only seven drivers that won multiple races in 2014 (the others being Keselowski, Jimmie Johnson, Jeff Gordon, Dale Earnhardt, Jr., series champion Kevin Harvick, and Carl Edwards). Logano doing burnouts after winning the Daytona 500. Logano's season began with an incident with Kevin Harvick during the Sprint Unlimited. Harvick, who questioned a late-race incident with Logano, exchanged heated words with Logano. The following week Logano held off Harvick to win the Daytona 500. 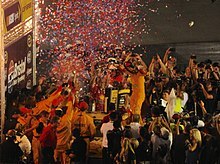 Logano also became the second youngest winner of the Daytona 500 (behind only Trevor Bayne) and also gave team owner Roger Penske his 2nd victory in the race, his first coming with Ryan Newman in 2008. The next week he got the pole at Atlanta Motor Speedway and he finished in 4th place. At Las Vegas Motor Speedway he qualified 2nd and led early but would ultimately fade to finish 10th after 2 pit road speeding penalties. At Phoenix International Raceway he started on the front row for the 3rd week in a row and led laps early, though he would ultimately finish 8th. At Auto Club Speedway, Logano started 13th and ran in the Top 5 most of the day, but a controversial late race pit road violation set him back in the field he recovered quickly however to finish 7th. With his finish on the lead lap at Auto Club Logano broke the record for most consecutive finishes on the lead lap with 22 (he would extend the record to 24 races). The previous record was held by Jeff Gordon and Dale Earnhardt Jr. with 21 each. The next week at Martinsville he won his second pole of the season, and during the race, he led the 2nd most laps and would finish 3rd. At Texas, he started 6th, led 19 laps, and finished 4th. At Bristol, Logano and Keselowski wrecked out early, ending Logano's streak of finishes on the lead lap. At Richmond, Logano won the pole and finished in fifth place. At Talladega, Logano was caught up in a multicar wreck on the back straightaway on lap 47 and finished 33rd. He dropped from 2nd to 4th in points after the race. At Kansas, Logano did much better. He won the pole for the 4th time and once again, finished 5th. In August, Logano ran out of fuel while leading the final laps at Pocono. At Watkins Glen, Logano started 16th, and went on to win the race, leading only the final lap after Harvick ran out of fuel before entering the final two turns. For Logano, the win also marked a complete sweep of the weekend, having also won the Xfinity race. Logano celebrates winning the 2015 Irwin Tools Night Race. Logano in victory lane after winning the Irwin Tools Night Race. At Michigan, Logano went on to bring home a seventh-place finish in the Pure Michigan 400. At Bristol, he took his third victory of the year with a win in the Irwin Tools Night Race. In the Chase, he swept the Contender Round races by dominating Charlotte, passing Matt Kenseth by purposely spinning him out with 5 laps remaining to win at Kansas and a dramatic win at Talladega that knocked Dale Earnhardt Jr. out of the Chase by 1 position. Also in the process, he became the second driver in 2015 after Kyle Busch to sweep three consecutive races. The next week at Martinsville, Logano had the dominant car for most of the race. However, Matt Kenseth, in retaliation for Logano spinning him out a couple weeks earlier, deliberately crashed Logano with less than 50 laps to go; an action that was met with mixed emotions from drivers, but the fans erupted with applause. Kenseth was suspended for the next 2 races and placed on probation until December 31. Logano didn't do well at Texas, cutting a tire and spinning out, as well as damaging the radio chords, winding up 40th. Heading into Phoenix, Logano needed a win in order to advance to the final round. Ultimately, it was denied, as he finished 3rd and was eliminated from the Chase at Phoenix International Raceway after a controversial finish where Dale Earnhardt Jr. won the race thanks to a storm in the area. Logano went on to finish 4th at the season finale, and finished 6th in the final standings. In 2016, Logano had a rocky start compared to 2015. Logano won his third straight pole at Martinsville, however, he would struggle throughout the race before finishing 11th. At Kansas and Talladega, Logano went back to back with DNFs from crashes. Logano won his first Sprint Cup All-Star Race after making a pass on Kyle Larson with two laps remaining. He won the FireKeepers Casino 400 from the pole in June 2016, the second time he won from the pole at Michigan. This was followed by a third-place finish at Sonoma and fourth place at Daytona. At Kentucky, Logano had an early exit on lap 54 after cutting a right front tire, finishing 39th. Logano bounced back with a third-place finish at New Hampshire and a seventh-place finish at Indianapolis. At Pocono, while on lap 115, Logano was racing Ryan Newman to his outside and Denny Hamlin to his inside when Chase Elliott got to his inside, got loose, got into Logano and sent both of them into the wall. Logano finished 37th. Following this, Logano went on a seven race stretch with a worst finish of 11th place: second place at Watkins Glen, 10th place at Bristol and Michigan, 5th place at Darlington, tenth place at Richmond, second place in Chicagoland, 11th in New Hampshire, and 5th place at Dover. Logano's 2016 Homestead car being prepared inside Team Penske's Mooresville, NC Race Shop. At Charlotte, the opening race in the Round of 12, Logano's day ended early with a series of tire blowouts, leaving him with a 36th-place finish. This was followed by a third-place finish at Kansas. At Talladega, Logano was penalized early when his car left pit road dragging the jack during the first round of green flag pit stops, but went on to win the race in overtime and clinched a spot in the Round of 8. The win marked the third straight restrictor plate victory for Team Penske, after Keselowski's earlier victories at Talladega and Daytona. A win at Phoenix guaranteed Logano a place in the final 4 at Homestead. Logano led 45 laps at Homestead and had a significant chance to win his first Cup series championship. With 10 laps left, Logano moved under leader Carl Edwards and wrecked Edwards on the restart. After a 30-minute red flag, Logano's car was too damaged to contend any further and Logano finished the race in 4th place, finishing second in the standings to Jimmie Johnson. Unlike in recent years, Logano had a miserable year. He started off the year however by winning the Advance Auto Parts Clash after sneaking through the last lap incident between Brad Keselowski and Denny Hamlin. Logano's 2017 season started with a sixth-place finish in the Daytona 500. In the Kobalt 400 at Las Vegas, Logano collided with Kyle Busch as the two battled for a top-five finish on the final lap. The contact spun Busch out and onto pit road; Logano finished fourth, while Busch dropped to 22nd. After the race, Busch confronted Logano on pit road, shoving him as their pit crews became involved. Busch suffered a bloody forehead in the ensuing brawl, though neither driver was penalized for the fight. In an ironic twist at the following week's race in Phoenix, Logano's tire blew with five laps to go to bring out the caution as Busch was in contention to win. As a result, Ryan Newman stayed out for the final restart and went on to win. At Richmond, Logano made his 300th cup start. Despite qualifying 5th, he would start from the 37th spot due to a transmission change. Logano would slowly work his way to the front, before winning his second career race at Richmond. Logano became the 6th driver to win in his 300th start. However, Logano's car was discovered to have a rear suspension issue, forcing NASCAR to declare his victory an "encumbered" win; as a result, while his win was not stripped, it did not allow him to lock a spot into the playoffs. At Kansas on May 13, Logano entered 6th on points. He had a rough race that saw him fall from second on the start to mid-pack. Logano battled setbacks such as a speeding penalty, and a cut tire which caused him to stay mid-pack for the rest of his race. Logano was charging towards the top ten, when his car's brakes broke, causing him to crash Danica Patrick and cause a fiery accident. The accident led to Aric Almirola being injured and airlifted to a local hospital for evaluation. Logano was visibly shaken following the wreck in a post-race interview. His contention to make it to the playoffs immediately started to fade away. His best finishes since (before Richmond) was 3rd at Michigan and his 4th-place finish at Indianapolis. After a series of bad races, Logano missed the playoffs by one spot, finishing behind Kyle Larson after having finished 2nd at Richmond. This is the first time Logano missed the playoffs since his last year with Joe Gibbs Racing in 2012. Due to his encumbered win, Logano's chance at a championship ended with his runner-up finish as after Darlington, he was in a must-win situation since the maximum points available in a race was 60 points as Logano was more than that many points away and points didn't matter anymore to make the playoffs. Ironically, the driver that benefited off of Logano's misfortune was Matt Kenseth, who barely made the playoffs by only about 100 points over Logano, keeping Logano out of the playoffs, reminiscent of their 2015-2016 feud. He then had consistent finishes like his 7th at Chicagoland Speedway, and 4th at Talladega. He finished the season with a 6th-place finish at Homestead-Miami Speedway. He finished the season 17th on points. 2018 was a very quiet but productive year for Sliced Bread. Logano started the season with a second place finish in the Clash. He followed that up with a second place finish in his duel, losing to teammate Ryan Blaney. Logano had his ups and downs at the 2018 Daytona 500 with a tire rub and a pit penalty but rebounded to finish fourth after avoiding a wreck with two laps left. At the 2018 GEICO 500, he held off Kurt Busch to win the race and lock him in the Playoffs. While the "Big Three" were making all the noise, Logano was quietly and patiently posting one of his best ever seasons. He had finished every race up until the second Daytona race, where he was involved in one of the pile-ups triggered by Ricky Stenhouse Jr. Then weeks later he finished dead last for only the second time in his career at Watkins Glen. Early in the race, he had been going through the carousel before breaking an oil pan. Crew Chief Todd Gordon misinterpreted the crash-clock rules, forcing an end to Logano's day early for the first time at The Glen in his career. The rest of the regular season was nothing but mostly top-10 finishes. He ended the regular season 6th in points into the playoffs. Logano started off the playoffs with a strong 4th-place finish at Las Vegas. Richmond, however was a quiet race but he ended it a lap down finishing 14th. A quiet race at Charlotte ended in a 10th-place finish and advanced to the next round. He started the Round of 12 by finishing 3rd at Dover and 5th at Talladega. He became the evident flag bearer for his team. After the Kansas playoff race, Logano became the sole Penske driver in the Round of 8 of the Playoffs after teammates Keselowski and Blaney were eliminated. entering the round of 8, Logano had a good chance to make it to Homestead and win the championship. He won the fall Martinsville race after a fierce battle with Martin Truex Jr. towards the finish line and secured his spot in the Championship 4. He dominated leading over half of the laps in the whole race to secure his first Grandfather clock. He then made a consecutive streak of top-tens with a 3rd-place finish at Texas. Logano had a pretty bad weekend at Phoenix, but prior in the press, he felt that he was the favorite for the championship, he suffered a flat tire in the second stage of the race in which ended his race, and his 6-consecutive top-ten finishes, although he still advanced, even if he had finished 2nd to 5th, in which he would have won a tiebreaker over Chase Elliott if he finished 5th. As the sun fell and the lights came on, Logano won at Homestead and became the 2018 Monster Energy NASCAR Cup Series Champion after passing Martin Truex Jr. with an incredible pass with 12 laps to go. Rounding out a stout season, in addition to his first title, he ended the season scoring three wins, 13 top-fives, and 26 top-tens. Logano started the season with a 3rd-place finish in the rain-cancelled Clash, in the duel, he made a big move on Clint Bowyer who led 41 laps on the final lap and won the duel only leading 1 lap, the last one. He started 4th at the Daytona, starting off the season as a strong contender for the championship. Logano battled back and fourth for the win all day, such as avoiding "The Big One" that took out 21 other drivers, but came up short to a 1-2-3 finish with the Joe Gibbs Racing team. After the race, Logano had confronted fellow Ford teammate Michael McDowell for not giving Logano the push he needed for the win. He left Daytona second in points, tied for the points lead with Denny Hamlin. At qualifying at Atlanta, he had problems in his qualifying laps and started 27th. The problems continued through the race. While he did contend for the win late, he suffered from tire issues to finish 23rd. Logano rebounded in the Pennzoil 400, holding off teammate Brad Keselowski for his first win at the track. The win at Vegas was fitting as it would be Logano's 22nd spring race in Las Vegas, his 22nd Cup win, and won in a Pennzoil-sponsored No. 22 car. Logano followed up his win with a 10th place run at Phoenix and a runner-up finish at Fontana. At Martinsville, Logano scored his 5th pole in 7 races, making it the 10th consecutive season where he has won a pole. It was a rough go at the start of the race. He led the first five laps and didn't lead the race again. He started 1st and finished 19th. It was not the result that the 22 team wanted. In 2009, Logano co-hosted an episode of WWE Raw with Kyle Busch. Logano has made cameo appearances in various TV shows. He appeared in Cartoon Network's Destroy Build Destroy in the episode "NASCAR Pile-Up Logano vs. Edwards". He beat Carl Edwards. The episode aired on October 20, 2010. In 2011, along with Carl Edwards and other NASCAR drivers, he was in the A&E series The Glades. During the year, he also participated in Man v. Food Nation, taking on the Atomic Bomb Challenge at Sticky Lips BBQ in Rochester, New York. He lost the challenge. During its 2011 season, Logano and Trevor Bayne were on a live portion of American Idol. In 2013, Logano guest-starred on a season two episode of Disney XD's Lab Rats. Logano appeared on an episode of American reality television series Pawn Stars where he inspected a Mustang GT alongside with Rick Harrison. Logano, along with Penske teammate Brad Keselowski, appeared in the movie Sharknado 3: Oh Hell No!. He also had a cameo appearance as a security guard in the 2017 film Logan Lucky. In October 2015, he appeared on 60 Minutes alongside a Wish Child who wanted to meet him, Gavin Grubbs. The two speak about the Make-A-Wish Foundation's granting of Gavin's wish. In 2016, Logano was a Fox NASCAR guest analyst for the Xfinity Series races at Phoenix and Richmond. A year later, Logano was a color commentator for the Fox broadcast of the Xfinity race at Pocono. Part of a Cup drivers-only coverage, he worked alongside Kevin Harvick and Clint Bowyer in the broadcast booth. As he started his career he earned the nickname “sliced bread” because he won a lot as a young racer. On November 13, 2013, Logano announced his engagement to childhood sweetheart Brittany Baca. He announced, via Twitter, that their wedding date was set for December 2014, during the NASCAR off-season. Logano and Baca were married on December 13, 2014. The couple announced the birth of their first child, a son named Hudson Joseph Logano, in January 2018. ^ "NASCAR Drivers, Race Standings & News - NASCAR.com". nascar.com. Retrieved 10 August 2015. ^ Sporting News Wire Service (July 19, 2008). "Logano driving Nationwide 20, but hoping for Cup 20". nascar.com. Madison, Illinois: NASCAR. Archived from the original on 2008-12-17. Retrieved 18 July 2015. ^ "JockBio: Joey Logano Biography". jockbio.com. Retrieved 10 August 2015. ^ "In Memory of Frederick Michael Biduk -- Portland Memorial Funeral Home, Portland, CT". portlandmemorialfh.net. Retrieved 10 August 2015. ^ "Logano, Salvatore Vincent". tribunedigital-thecourant. Retrieved 10 August 2015. ^ "Joey Logano :: NASCAR's Rising Young Star" (PDF). Jeffspeer.com. Retrieved 2013-04-17. ^ "Joey Logano early racing career records". loganomotorsports.com. Archived from the original on 7 November 2015. Retrieved 10 August 2015. ^ a b "JoeyLoganoRacing.com: Biography". joeyloganoracing.com. Retrieved 10 August 2015. ^ "NASCAR news, rumors, results, video highlights and more". Sporting News. Retrieved 10 August 2015. ^ Bernstien, Viv. "Logano, 18, to Make Nationwide Debut ", New York Times, May 25, 2008, accessed June 26, 2009. ^ "18-Year-Old Wins". The New York Times. Associated Press. June 15, 2008. Retrieved March 3, 2019. ^ Pockrass, Bob (October 1, 2013). "Logano's Nationwide team hit with 6-point penalty for infraction at Dover". Sporting News. Retrieved 2013-10-02. ^ a b "NASCAR Drivers, Race Standings & News - NASCAR.com". nascar.com. Retrieved 10 August 2015. ^ Gelston, Dan (June 10, 2012). "Joey Logano wins at Pocono Raceway for 2nd title". Atlanta, GA. Retrieved 2012-06-10. ^ "CUP: Logano To Join Penske Racing In 2013". Archived from the original on 2012-09-06. ^ Beacham, Greg (March 22, 2013). "Home Sports Motorsports Denny Hamlin's Bristol feud with Joey Logano still not resolved heading into Fontana weekend". Star Tribune. Minneapolis, MN. Archived from the original on April 11, 2013. Retrieved 2013-03-25. ^ "Joey Logano 2013 NASCAR Sprint Cup Results". Racing-reference.info. Retrieved 2013-04-17. ^ "Tony Stewart and Joey Logano fight after race". Usatoday.com. 2013-03-25. Retrieved 2013-04-17. ^ Caraviello, David (April 17, 2013). "NASCAR lowers boom on Penske Drivers". NASCAR.com. Retrieved 1 May 2013. ^ Ryan, Nate (May 1, 2013). "NASCAR panel upholds penalties to Penske Racing teams". USA Today. Retrieved 1 May 2013. ^ Trister, Noah (2013-08-16). "Logano sets track record in qualifying at Michigan". Yahoo! Sports. Archived from the original on 2013-08-21. Retrieved 2013-08-16. ^ Owens, Jeff (August 18, 2013). "Joey Logano wins at Michigan for his victory with Penske Racing". Sporting News. Retrieved 2013-08-19. ^ "Logano rises to top for Sprint Cup pole"
^ Fryer, Jenna (February 22, 2015). "Joey Logano Wins Daytona 500". ABC News. Retrieved February 26, 2015. ^ Bromberg, Nick (August 9, 2015). "Joey Logano passes Kevin Harvick on last lap to win at Watkins Glen". Yahoo Sports. Retrieved August 9, 2015. ^ DeCola, Pat. "Cut tire puts Joey Logano in big Chase hole". Retrieved 15 September 2017. ^ Owens, Jeff (16 November 2015). "Joey Logano gracious in defeat after being eliminated from Chase". Sporting News. Retrieved 15 September 2017. ^ a b Wise, Brandon (March 12, 2017). "WATCH: Kyle Busch attacks Joey Logano in epic post-race NASCAR fight". CBSSports.com. Retrieved March 21, 2017. ^ DeGroot, Nick (March 15, 2017). "NASCAR will not penalize Kyle Busch or Joey Logano for Vegas fight". Motorsport.com. Retrieved March 21, 2017. ^ DeLuca, Dave (March 19, 2017). "NASCAR at Phoenix: Ryan Newman wins; Joey Logano costs Kyle Busch again". Sporting News. Retrieved March 21, 2017. ^ Pistone, Pete (April 30, 2017). "Logano Wins Richmond in 300th Start". Motor Racing Network. Archived from the original on 2017-05-04. Retrieved May 4, 2017. ^ Perez, A.J. (May 4, 2017). "Joey Logano's team is penalized, making Richmond an 'encumbered' win". USA Today. Retrieved May 4, 2017. ^ Busbee, Jay (October 27, 2009). "Kyle Busch, Joey Logano bring the pain at WWE Raw". From the Marbles. Yahoo! Sports. Retrieved 2013-11-18. ^ Busbee, Jay (October 20, 2010). "Carl Edwards, Joey Logano join 'Destroy, Build, Destroy'". Yahoo! Sports. Retrieved December 30, 2014. ^ Jicha, Tom (June 26, 2011). "NASCAR drivers play themselves on 'The Glades'". Sun-Sentinel. Retrieved December 30, 2014. ^ Busbee, Jay (October 20, 2011). "Joey Logano challenges monster burger on 'Man vs. Food Nation'". Yahoo! Sports. Retrieved December 30, 2014. ^ Gluck, Jeff (March 26, 2011). "NASCAR's American Idols: Trevor Bayne, Joey Logano Appear On Hit TV Show". sbnation.com. Retrieved December 30, 2014. ^ Busbee, Jay (March 25, 2011). "Logano, Bayne look not at all awkward on 'American Idol'". Yahoo! Sports. Retrieved December 30, 2014. ^ "Logano stars on Disney XD's 'Lab Rats'". NASCAR.com. July 22, 2013. Retrieved 2013-07-30. ^ Norman, Brad (June 17, 2015). "Shark Bati: Keselowski, Logano in Movie Trailer". NASCAR. Retrieved July 23, 2015. ^ "How do Make-A-Wish wishes come true?". CBS News. October 15, 2015. Retrieved November 17, 2015. ^ Long, Mark (November 15, 2013). "Logano gets engaged to longtime girlfriend". The Washington Times. Washington, D.C. Retrieved 2013-11-17. ^ "Just married! Joey Logano ties the knot with Brittany Baca". Foxsports.com. December 14, 2014. Retrieved 2015-02-26. ^ Hille, Bob (January 5, 2018). "Joey Logano, wife announce birth of son". Sporting News. Retrieved January 6, 2018. ^ "Joey Logano – 2007 NASCAR Busch East Series Results". Racing-Reference. Retrieved June 29, 2017. ^ "Joey Logano – 2007 NASCAR West Series Results". Racing-Reference. Retrieved June 29, 2017. ^ "Joey Logano – 2009 NASCAR Camping World West Series Results". Racing-Reference. Retrieved June 29, 2017. ^ "Joey Logano – 2011 NASCAR K&N Pro Series West Results". Racing-Reference. Retrieved June 29, 2017. 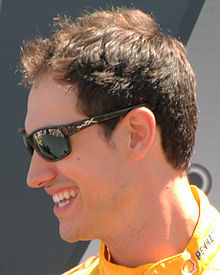 Wikimedia Commons has media related to Joey Logano.